I received a BFA from the Pratt Institute, Brooklyn, New York, in 1970. As a major in the sculpture department, I became interested in the textile traditions of “women’s work” and began to crochet most of my class assignments using unexpected and non-traditional materials. It was an exciting time of self-discovery and artistic expression, and I was absorbed by the attitudes of the counter culture generation and its anti-establishment ideas. 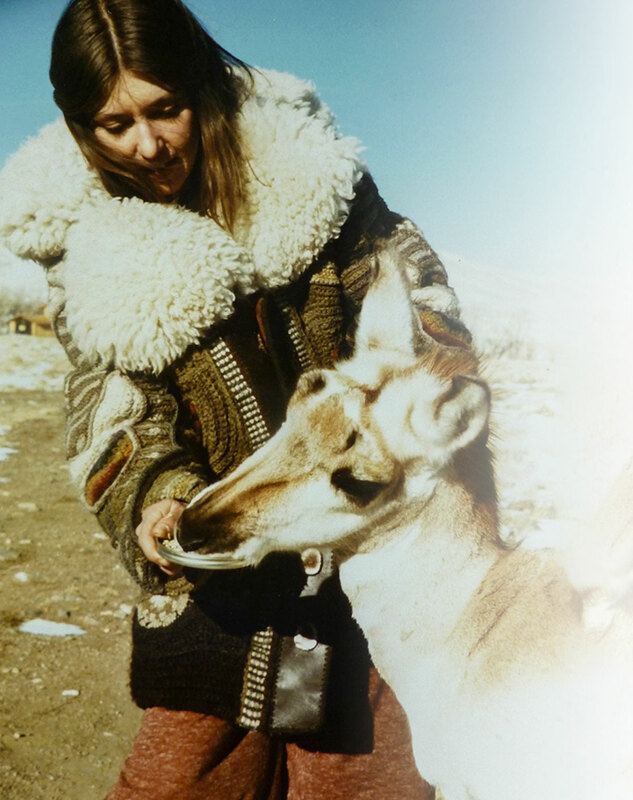 While living in rural Wyoming between 1971 and 1978, I worked primarily with crochet, natural dyes and spinning and felting wool to create one-of-a-kind garments. Native American symbols, the color of the land, and the beauty of the vast western prairie informed much of my art. Driven by both process and ideas, I saw the garment as a canvas to color, a form to sculpt and an object that could combine both fantasy and function. The garments I fashion must go beyond what is fashionable. Art to Wear clothing, in my definition, transforms both the body and the spirit, physically and metaphorically. I have always been drawn to the beauty of handmade textiles. In particular, the appliqués of the San Blas Indians with their colorful and pictorial Mola created a foundation for my sewn cloth during the 1970’s and 80’s. 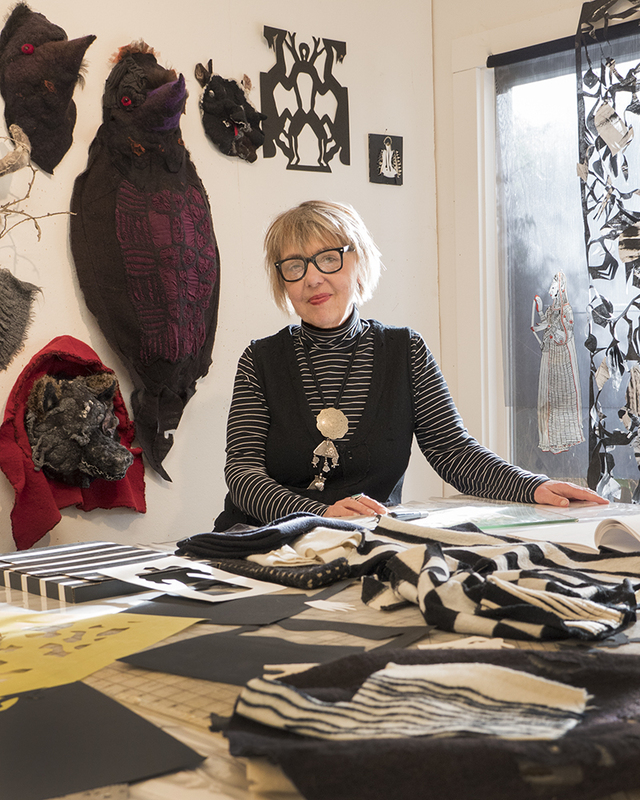 Over the years, buying woven and knitted wool by the yard saved a lot of time so that I could focus on the process of designing, dyeing, shrinking and piecing graphic elements of cloth together with reverse appliqué techniques. In 1992, my husband and I formed the company LC Designs, producing a limited collection of appliqué coats and jackets. The collection flourished and included garments made from my “invented” fabrics; slashed, pierced, and shrunken wool knits. By 2000, I was looking for another fabric to utilize and began experimenting with a fulling (shrinking) resist paste technique on lightweight wool gauze. I worked several years refining ways of printing and creating pattern and texture on this sheer fabric, further developing the resist paste process. To date, my discoveries include working with mixed media and finding new ways to alter surfaces and structures while telling a good tale. Today, my works can be found in the permanent collections of the M.H. de Young Museum, San Francisco; the Oakland Museum of California; the Museum of Art and Design, New York; the Museum of Fine Arts, Boston; and the Tassemmuseum Hendrikje, Amsterdam. I teach nationally and internationally and have lived and worked in Berkeley, California since 1980.